The exam consists of a coding project and an exit interview. Both of these exam components are available only in English at this time. The exam is designed to test the skills of an entry-level Android developer. Therefore, to take this exam, you should have this level of proficiency, either through education, self-study, your current job, or a job you have had in the past. Assess your proficiency by reviewing "Exam Content." 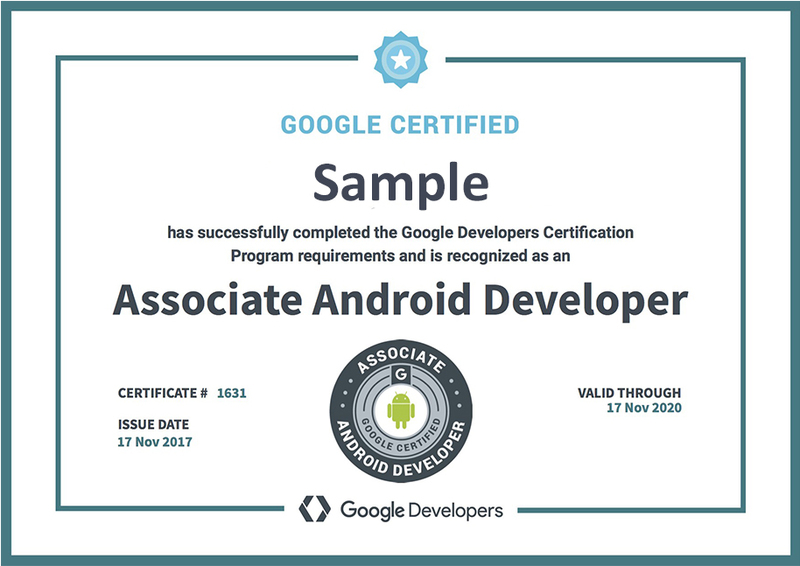 If you'd like to take the exam, but feel you need to prepare a bit more, level up your Android knowledge with some great Android training resources. 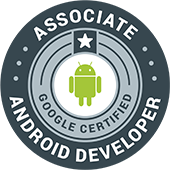 You must use the latest version of Android Studio to complete the Associate Android Developer Certification Exam. If you are under 13, you are not eligible to take the exam or to become certified. If you are between 13-17 years of age, you may test and receive certification with parental consent. If you are participating in a location that requires by law a lower minimum age for entry into such programs, then the minimum age limit for that person will be the stated minimum required age. Individuals 18 years or older are eligible for certification without any age-related restrictions. Writing tests to verify that the application's logic and user interface are performing as expected, and executing those tests using the developer tools. Candidates should be able to analyze application crashes, and find common bugs such as layout errors and memory leaks. This includes working with the debuggers to step through application code and verify expected behavior. Implementation of the visual and navigational components of an application's design. This includes constructing layouts—using both XML and Java code—that consist of the standard framework UI elements as well as custom views. Candidates should have a working knowledge of using view styles and theme attributes to apply a consistent look and feel across an entire application. Understanding of how to include features that expand the application's audience through accessibility and localization may also be required. Understanding of Android's top-level application components (Activity, Service, Broadcast Receiver, Content Provider) and the lifecycle associated with each one. Candidates should be able to describe the types of application logic that would be best suited for each component, and whether that component is executing in the foreground or in the background. This includes strategies for determining how and when to execute background work. Determining appropriate use cases for local persisted data, and designing solutions to implement data storage using files, preferences, and databases. This includes implementing strategies for bundling static data with applications, caching data from remote sources, and managing user-generated private data. Candidates should also be able to describe platform features that allow applications to store data securely and share that data with other applications in. Extending applications to integrate with interfaces outside the core application experience through notifications and app widgets. This includes displaying information to the user through these elements and keeping that information up to date. Candidates should also understand how to provide proper navigation from these external interfaces into the application's main task, including appropriate handling of deep links.